The Yantra as readers can see by studying the diagram of the Yantra shown in this post is a combination of unique letters and numbers, which are said to generate the energy needed to cast this occult spell on the target person. The Vashikaran Yantra Experiment can be easily performed by both men and women to attract their desired lover or life partner. The Vashikaran Vidhi is as mentioned above most simple and easy to understand. The Yantra should be drawn on any piece of clothing like a dress, shirt, pant or handkerchief which is regularly being worn by the practitioner. The name of the desired beloved should be written at the top of the Yantra. The Vashikaran Yantra can be written with any kind of pen or ink on any day and time. The piece of clothing with the Yantra drawn on it should be burnt to ash and then the ash should be collected and a pinch of the ash should be mixed into the food or any kind of eatable or beverage and then given to the targeted lover to eat. This is said to cast a most powerful love spell on the targeted lover and bring him or her under the most powerful influence of the practitioner by being attracted to the practitioner. The most important ingredient needed to gain success in these kinds of Vashikaran Experiments is the single minded intensity with which they are practiced by the practitioner. Note- All the information given in this article is as per the concerned Indian Vashikaran Tantra and is published solely for educational purposes. This site does not guarantee the success of this enchantment experiment. hello awais.. can u elaborate about your procedure please.. and how long it took? Neelj, after I burn the cloth, from the whole ash just a pinch of ash has to be used for vashikaran? What to do with the rest of the ash? You can dispose it off, in any way you please. Can we do multiple mantras and tantras on same single target in same time for quick results. Better to concentrate upon a single mantra experiment for the same purpose. dear sir, the letters are unclear in the diagram. I m requesting to add big letters in it. Or it is hwlpful even if mentioned at a side of it . Yes, that is if you want them to become sexually attracted to you. 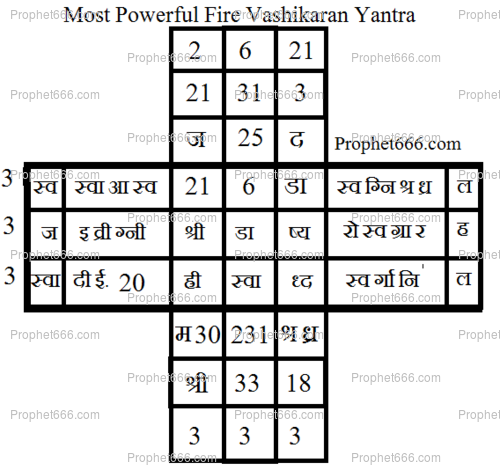 You can browse the Vashikaran Yantras for a Yantra, which is suitable for your purpose. Neel is it necessary to burn the cloth the same day we'll give it to the targeted person or can we preserve it in any sort of cloth or paper and later on give it to the lover ? The cloth should be burnt the same day, but the ashes can be preserved and used as and when needed. Pranam. Which cloth we have to use ? I mean washed or unwashed..